As a young child in the late 1950’s, I shadowed my mother everywhere she went. I was her Baba Looey to her Quick Draw McGraw, Boo Boo to her Yogi Bear, Tonto to her Lone Ranger.Within her sphere of influence I was a contented little satellite, spinning in her orbit wherever she went. Whether shopping or schlepping, picking up or dropping off, I would follow in her footsteps in the seemingly endless tasks of doing for others. The errand I enjoyed tagging along with the most was her weekly appointment at the Girls-Only-Glam-A-Rama Beauty Parlor, the one thing she did all week just for her. A unique universe unlike any place else, where unfamiliar, strange-looking equipment was being used by familiar neighborhood women looking strange, all dressed alike, their ordinary clothes replaced by identical leopard print smocks. A universe with its own uniform. A universe where gossip was as hot and swift as the air blowing through the missile shaped hairdryers, where I was privy to carefully guarded grown up secrets. Strange intimacies grew between women who organized carpools and now found themselves sitting, captive under pink hair dryers. It was over the roar of the dryers in the afternoons while casseroles simmered in automatic ovens back home that these women gave full voice to secret whispering fears. Somehow dread words could be spoken and reassurances offered. In the shadow of the hairdryers, as nails were polished, calluses scraped and hair teased, dread words could be safely spoken. 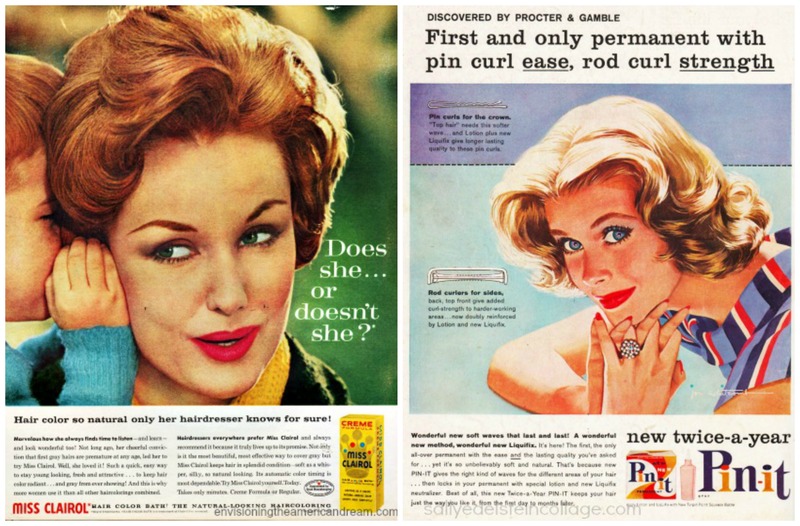 Despite the fact that the sight of women in pink plastic curlers was becoming more and more common a sight in public and not discounting the legion of devotees of Miss Clairol and Toni Home permanents, beauty parlors were busier than ever. This was due in part to the popularity of the most asked for hair ‘do of the year- the bouffant. The perfect ‘do for the world of tomorrow, one in which man is ever striving for new, ever higher horizons. Despite its French origins, it was a concoction that showed Americas might with its height, and was protected by inpenetrateable layers of lacquer. Entering the Beauty Parlor, the Saturday before Mothers Day, you could feel the excitement in the air. A beehive of activity, a festive feeling had been added to the usual rhythmic pulse, as women pampered themselves for their big day. Decorated to reflect the miracle of spring time, the room was showered with an assortment of plastic flower arrangements gracing walls and counters. These Forever-Flowers imported all the way from exotic Hong Kong and purchased from the nearby Fancy Goods department at Woolworths would be given to each lucky lady as a final parting gift for Mothers Day. 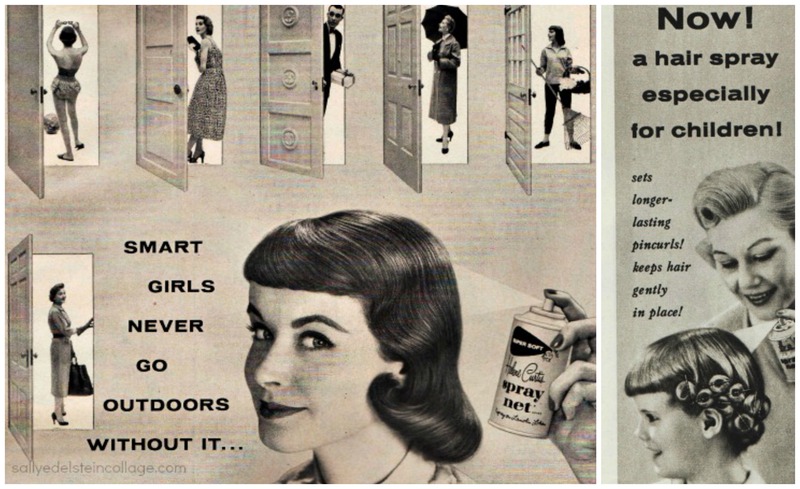 The air bristling with Mothers Day plans, was heavy with the cloying sweetness of perfume diluted by the acrid smell of singed hair, nose burning acetone, ammonia, and other chemical combustibles. The sound of “What a Difference a Day Makes” playing on the radio was nearly drowned out by the constant hum of hairdryers and the constant chattering among the ladies. Even Dinah Washington’s fervent voice was no match for these yentas. 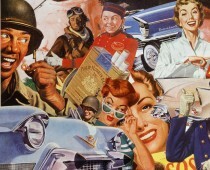 It was under those missile shaped dryers that sizzling party recipes were hotly debated and exchanged; fondues were scrutinized, zippy dips and dunks dissected, chex party mix gone over with a fine tooth comb and potato chips pondered-with or without ridges. Heavy trading went on, swapping a cherished Kraft TV Theatre clam dip recipe, for a new twist on Rumaki. Like a game of musical chairs, the rows of turquoise hydraulic styling chairs filled with chain-smoking Moms, remained stationary with the gals themselves moving slowly from chair to chair progressing from one stage of metamorphosis to the next. A seamless transition that would have pleased Henry Ford. One row of post-shampoo ladies, looked like a pack of wet poodles, puffing on their Parliaments, having their nails done as they patiently bided their time for the next step of transformation . Further down the assembly line, another group of adventurous gals- gals who wouldn’t take dull for an answer-sported freshly shorn locks slathered with gobs of goo and eye burning glop, that would turn them into glamorous if-I’ve-only-one- life- to- lead- let –me- live- it –as- a -Blonde. 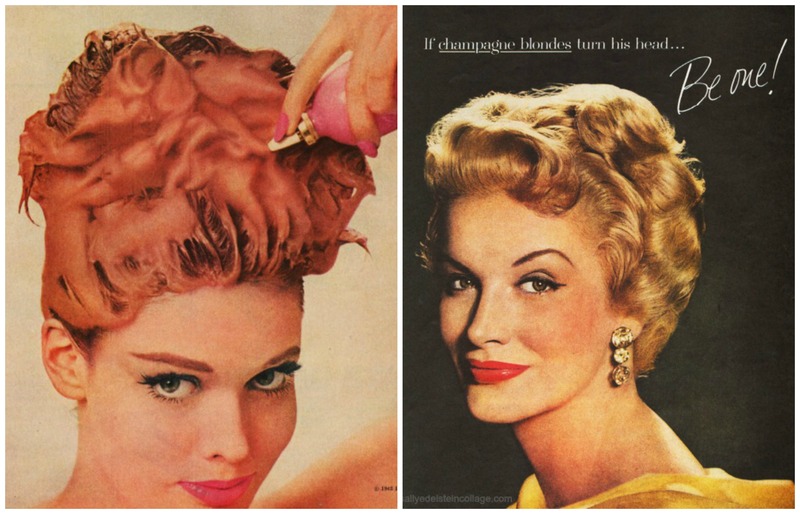 Just the thing for the upcoming summer scene, Clairol had popped the cork on new Champagne blondes, vintage 1960. In between, eyebrows were plucked, and lips waxed, until finally scalps were tortured with clips, and curlers, and subjected to searing blasts of heat while seated under hair dryers. 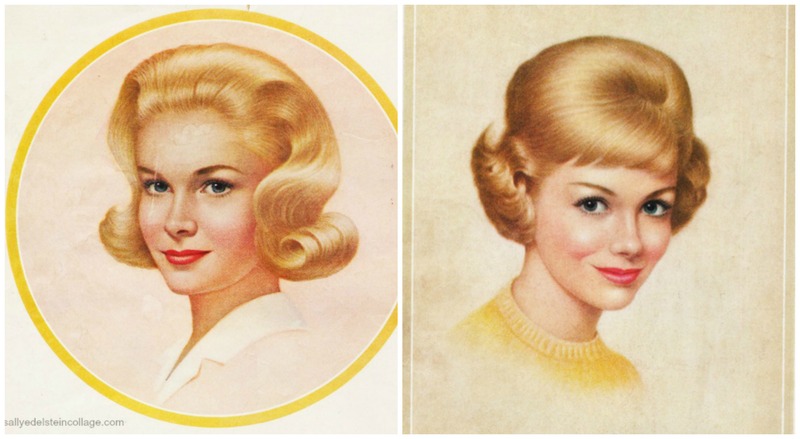 Was it really true Blondes had more fun? 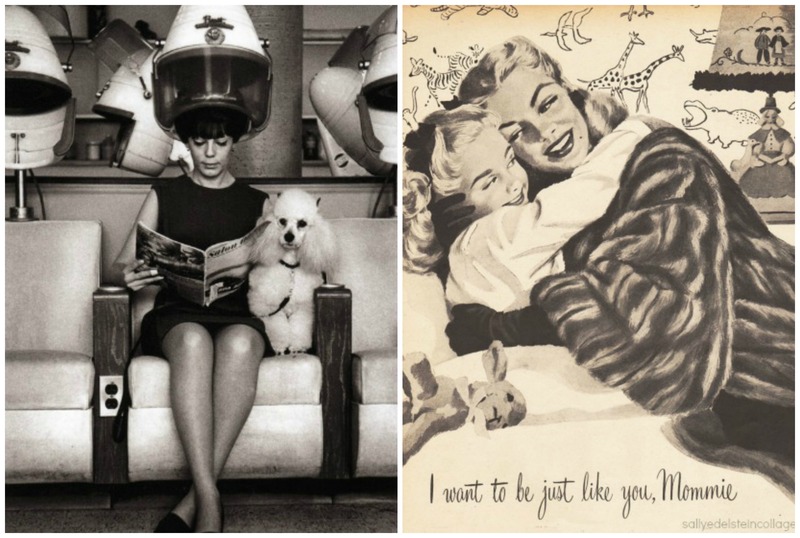 Sinking into a padded swivel styling chair, I sat next to Mom carefully watching as Miss Blanche, combed and teased, bombarding Mom with hairspray. 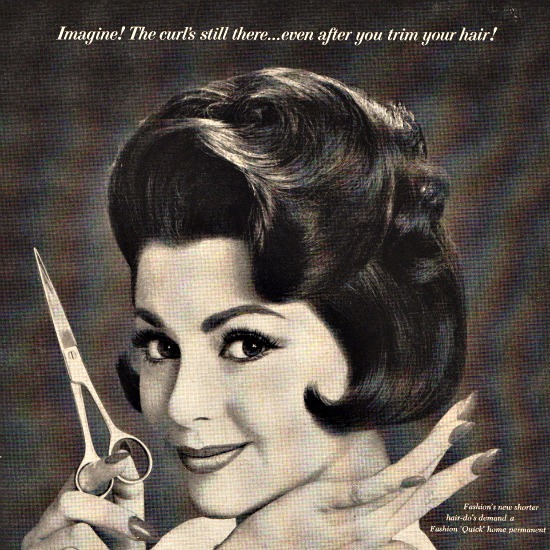 This was truly a space age hair do with its propulsion accomplished by strenuous backcombing. The ‘do was composed of three major assemblies, the set with curlers, the thrust, or tease, and the fusing device of heavy hair spray. “There isn’t a head of hair that can’t profit in prettiness and manageability from spray,” Miss Blanche was fond of saying. “Going to the moon, or just getting back?” Dad would smile at Moms hair, the shape of a space helmet. The petite, bespeckled, hairdresser wobbled precariously on spindly Lucite spiked heels, her own massively teased confection of taffy colored hair towered over us all, tempting fate and physics that its enormity wouldn’t tip her over. It was truly aero dynamic. A true artiste‘, Miss Blanche would always try for the exact balance so the coiffure would frame the clients face just right. Stepping back from her work like Picasso, she squinted thoughtfully through her iridescent, greenish gold cat- eyes frame glasses, at Moms face in the mirror, as if she were following the progress of a painting. Of course my own myopic Mom stripped of her own blue and silver specs, would squint right back at her. 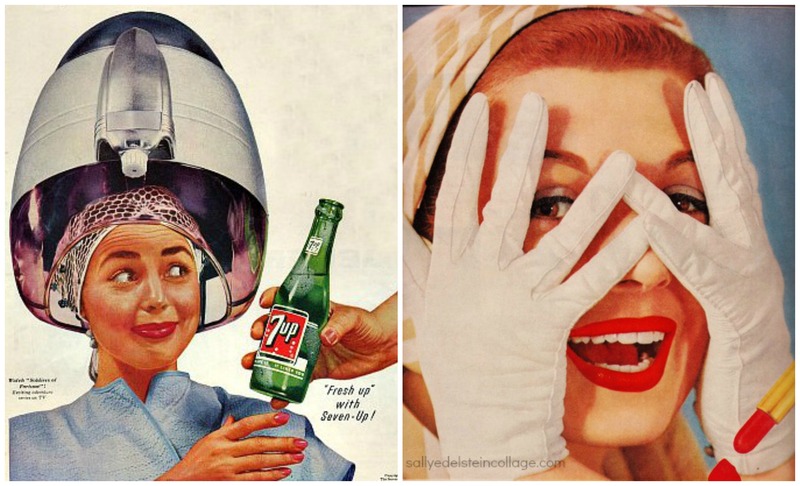 With the skillful use of fluorescent lighting, the unqualified, belief in hairspray, this world of tomorrow was a world of beauty. Holding her hands in front of her, drying on her nails was a fresh coat of frantic red. Because it was Mothers Day Mom treated herself to a professional manicure unlike her normal dash of polish 20 minutes before party guests came. Patting her lush brown bouffant coif floating like a gentle cloud above her head, Mom left happy, with a new recipe for cheese Fondue clutched in her hands, a sure-fire ( probably highly flammable) solution for removing stains, and clutching her Mothers Day bouquet of forever your pink plastic flowers, bendable and moveable to arrange just as you like. 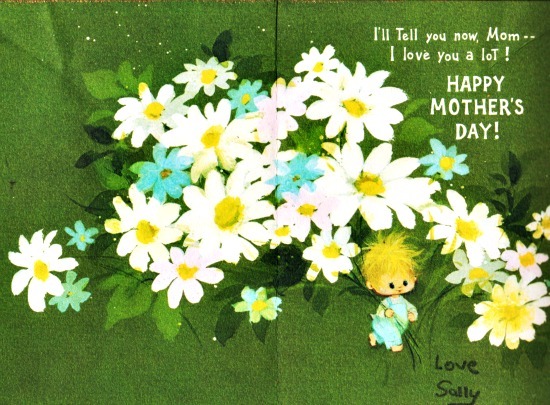 I can tell by the way you often write about your dear mother, she was blessed with a very loving daughter. Thank you so much for your kind words, which mean a lot to me. I lost my mother 5 years ago and there is not a day that goes by that I don’t miss her.